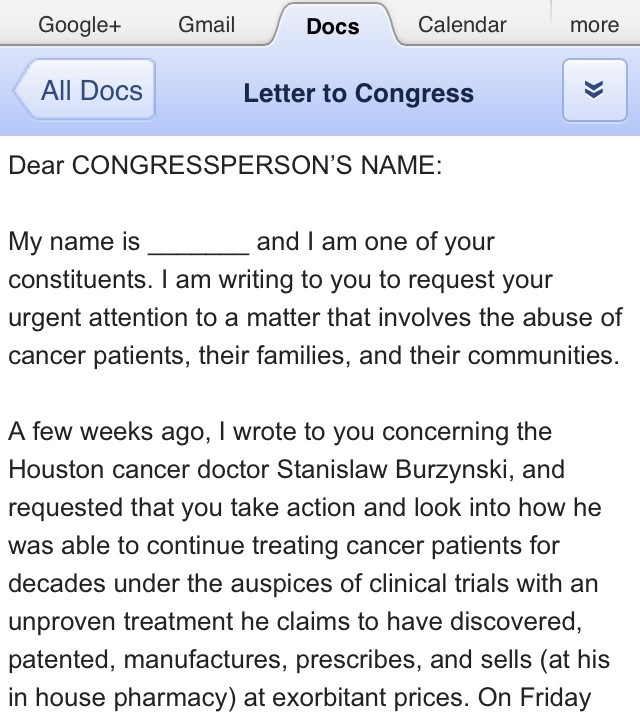 Burzynski, S.R. The Present State of Antineoplaston Research. Integrative Cancer Therapies 2004;3:47-58. Antineoplaston A2, which contributed to the highest number of complete responses in phase I clinical studies, was elected for final purification, isolation of active components, and structure determination. 28. Burzynski SR, Hai TT. Antineoplaston A10. Drugs of the Future. 1985;10:103-105. 29. Burzynski SR. Synthetic antineoplastons and analogs. Drugs of the Future. 1986;11:679-688. 30. Burzynski SR, Mohabbat MO, Lee SS. Preclinical studies of antineoplaston AS1-1 and antineoplaston AS2-5. Drugs Exptl Clin Res. 1986;12(suppl 1):11-16. 31. Burzynski SR, Khalid M. Antineoplaston A10 injections. Drugs of the Future. 1986;11:364-365. 32. Burzynski SR, Khalid M. Antineoplaston AS2-1. Drugs of the Future. 1986;11:361-363. 33. Burzynski SR. Antineoplaston AS2-5.. Annual Drug Data Report. 1986;8-319. 35. Burzynski SR. Phase I clinical studies of antineoplaston AS2-5 injections. In: Ishigami J, ed. Recent Advances in Chemotherapy. Tokyo, Japan: University of Tokyo Press; 1985. 36. Burzynski SR, Burzynski B, Mohabbat MO. Toxicology studies of antineoplaston AS 2-1 injections in cancer patients. Drugs Exptl Clin Res. 1986;12(suppl 1):25-35. 37. Burzynski SR, Kubove E. Toxicology studies of antineoplaston A10 injections in cancer patients. Drugs Exptl Clin Res. 1986;12(suppl 1):47-55. 38. Lehner AF, Burzynski SR, Hendry LB. 3-phenylacetylamino-2,6-piperidinedione, a naturally-occurring peptide analog with apparent antineoplastic activity may bind to DNA. Drugs Exptl Clin Res. 1986;12(suppl 1):57-72. 39. Ashraf AQ, Liau MC, Mohabbat MO, et al. Preclinical studies of antineoplaston A10 injections. Drugs Exptl Clin Res. 1986;12(suppl 1):37-45. 41. Hendry LB, Muldoon TG, Burzynski SR et al. Stereochemical modeling studies of the interaction of Antineoplaston A10 with DNA. Drugs Exptl Clin Res. 1987;13(suppl 1):77-81. 42. Ashraf AQ, Burzynski SR. Comparative study of antineoplaston A10 levels in plasma of healthy people and cancer patients. Adv Exptl Clin Chemother. 1988;2:19-28. 44. Burzynski SR, Kubove E, Burzynski B. Phase I clinical studies of oral formulation of antineoplaston AS2-1. Adv Exptl Clin Chemother. 1988;2:29-36.
were selected for phase II studies. and were conducted outside investigational new drug (IND) process. 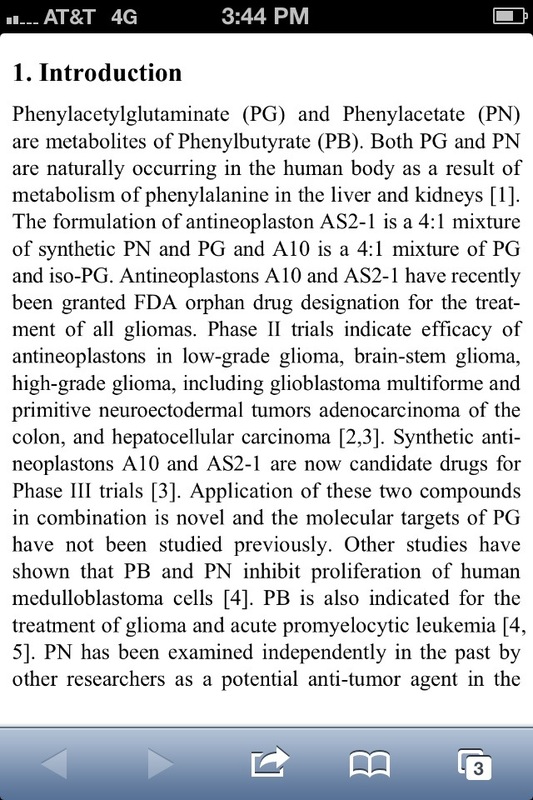 Phenylglutamine (PG) exhibits antineoplastic activity across wide array of cancer cell lines. Reduction in amino acid availability may contribute to drug’s antineoplastic activity. Human glioma (U-87) cells rapidly take up Phenylglutamine (PG) by mechanism similar to facilitated diffusion. Upon removal of Phenylglutamine (PG) from media, PG rapidly and completely effluxes from the cell. are a class of 12 antitumor agents. Following synthetic antineoplaston formulations used in phase II studies. Available in 500 mL and 1000 mL (300 mg/mL) plastic bags. Available in 250 mL (80 mg/mL) plastic bags.